The Swarm were the youngest team in the NLL in 2012. How young were they? Jeff Gilbert was the oldest player on the team at the age of 29. The season didn’t start off strongly, and by early March the Swarm were sitting at 3-7 and tied for last in the West. But suddenly everything just seemed to fall together, and they won three straight by 7, 9, and 14 goals. It looked like the Swarm would finish strong but then they lost two of their last three and did finish last in the west. Thanks to the lousy Bandits season, the Swarm were able to cross over to the East where they crushed the Rock 20-11 before the Knighthawks ended the up-and-down Swarm season in the division finals. The Swarm are now back in the East division, where they were from 2005-2008. Unfortunately for them, this means that they’ll have to face former star Ryan Benesch more often than they would have if they’d stayed in the West. Obviously the biggest loss is Ryan Benesch, right? On the offensive side of the floor, sure, but it could be argued that trading Evan Kirk and going with Tyler Carlson as the full-time starting goaltender is even more significant. Carlson played 505 minutes last year, about the same as his rookie year. But compare that with Mike Poulin, Matt Vinc, and Nick Rose, all of whom were over 900 minutes. And given that there are two extra regular season games, Carlson is being asked to basically double his playing time from last year. The loss of Benesch will definitely hurt the Swarm offense – he’s been one of the most dynamic scorers in the league for years and led the Swarm in goals last year. But 2013 was Callum Crawford’s best season ever, Shayne Jackson and “transition players” Kiel Matisz and Jordan MacIntosh are only going to get better, they’ll get a full season of Josh Gillam (19 points in 6 games), and there’s a couple of new kids in town: Logan Schuss and Scott Jones. Given all of that, the Swarm just might be able to get by without a huge drop in offense. Three young defense/transition players from last year – Jay Card, Corbyn Tao, and Dan Ball – will not be returning this year, but former Rock defender Mike Hobbins joins the team and Swarm fans are anxious to see Jason Noble in action. But the return of Andrew Suitor is likely the most welcome change to the team, after the captain missed eleven games to injury last year. Kiel Matisz. He’s listed under “transition”, but don’t you believe it: he’s a forward. After a 63-point rookie season and runner-up for Rookie of the Year, I can see the man they call Moose challenging Crawford for the team scoring lead. 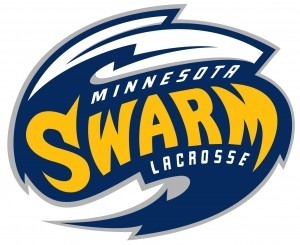 This entry was posted in Minnesota Swarm, Preview. Bookmark the permalink.